I know you’re thinking “here she goes again with the fabric tape!” I might be a little (maybe a lot) obsessed with this stuff. When there are so many great projects that require sewing, and you find an alternative that doesn’t require a single needle, you jump for joy! I hate sewing, can you tell? 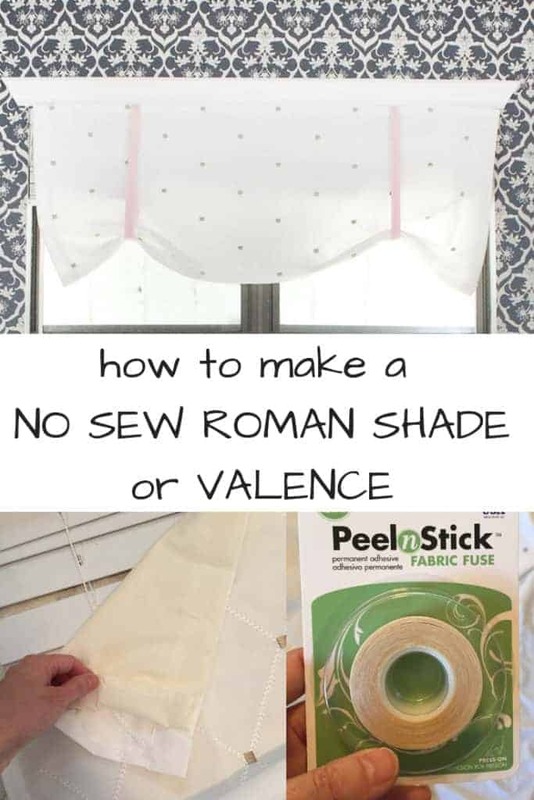 Let me dive straight in to yet another NO SEW project and this one is all about how to make a roman shade or valence from a shower curtain. I’ve attached my YouTube video at the bottom of this post, but if you are one of the few people that prefers reading a DIY or tutorial, read on my friend! This post contains affiliate links. This means that if you purchase from one of these links I will receive a small commission but rest assured you will pay no more for the product. Thank you for supporting my blog! I’m using a shower curtain to create a roman shade valence. This shower curtain happened to be on sale at Bed Bath and Beyond. The reason a shower curtain works well is because it is wide and will fit the width of almost any window. Most shower curtains also have a decorative hem at the top that slides or fits into the shower curtain rod. Just as a shower curtain fits into a shower curtain rod, your new no sew roman shade will fit into a curtain rod! This saves time and work! Yay for repurposing a shower curtain to a roman shade! Most shower curtains are not lined. 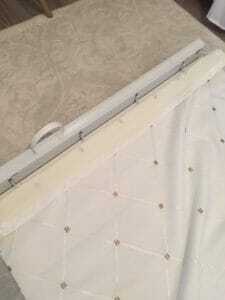 This provides a problem and will require you to back the fabric with a solid piece of material. I have chosen to cut up an old sheet to line the shower curtain with. 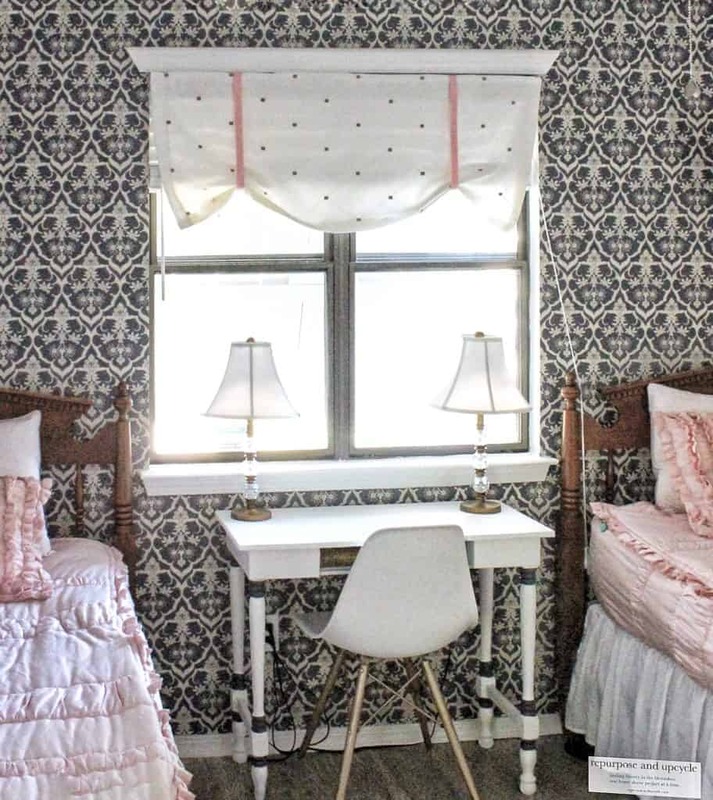 If you choose to use fabric to make this DIY roman shade or valence, you might not have to line it if you purchase upholstery weight fabric. 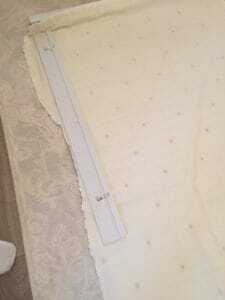 Now that you understand why I am using a shower curtain to make a roman shade valence, let me show you how. The first thing you need to do after gathering your materials is to measure the length and width of your window. This is where you need to decided if you are making a regular roman shade or just a valence. The method to making both are exactly the same, you just need to alter the length based on which one you choose. Once you’ve measured the window and have your exact measurements, add at least 3 inches to each side (this will allow room to make the “hems”). If you are lining the roman shade, cut out your lining material and start using your double sided fabric tape (I use the iron on for this part) and back the entire shade. 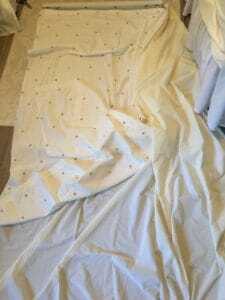 You can see below where I’ve started to lay out the lining (old sheet) under the shower curtain so I can measure and cut! 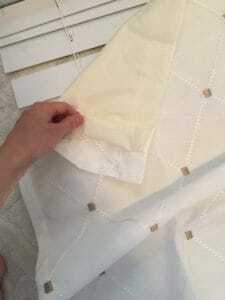 Next grab your iron on fabric tape and start attaching the lining to the shower curtain or fabric. I attached the lining up to the edge of the two sides that I cut. I did, however, only attach the lining to the inside of the other two sides that already had a hem. 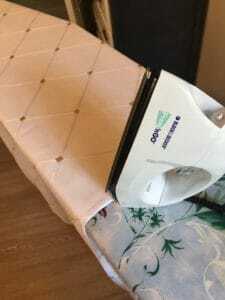 Once you’ve fully lined your roman shade or valence, it’s time to make the “hem.” The easiest way to do this is to grab a straight edge and fold over the outside edge to the inside (to make sure it’s straight) and attach it with fabric tape. Once you’ve lined the shade, “hemmed” all the edges, and have a nice looking curtain, it’s time to add the ribbon. This is where the curtain will look more like a roman shade. Before I added the ribbon, I attached the curtain to the outer edge of the blinds. I did this with the peel and stick fabric tape. You can choose to do this before you attach the curtain, it’s completely up to you. For me, I thought it would be easier to attach it first. If you are sliding your shade into a curtain rod, you can either do that now or after you attach the ribbon. All that’s left to do is to attach the ribbon! There are a few different ways to do this. You can use a piece of ribbon in the middle, or two on the sides, or three or four! I attached the ribbon to the back side of the curtain with, yes, peel and stick fabric tape. Now you’re done! 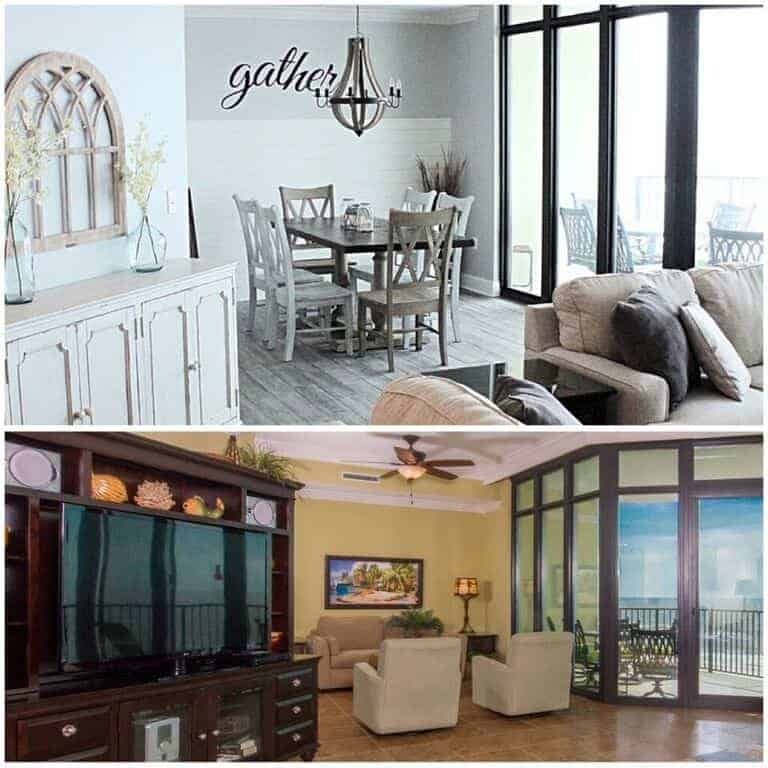 Hang that DIY roman shade or valence and enjoy! Do y’all follow me over at YouTube? I’m trying my best to get into “vlogging” by sharing more videos. I’m a visual person, and I know I would rather watch at tutorial than read one, so I figured others would too. Below is my video tutorial on how to make a no sew roman shade or valence from a shower curtain. Now tell me, isn’t fabric tape the best? LOL. Thanks for stopping by. If you enjoyed this post you might like a few other No Sew posts below. This turned out so good, I love it!! OH my goodness, this is totally amazing and brilliant. I need to do this!! 🙂 Pinning, for sure! Beautiful valance for the window! Thank you for sharing at Party In Your PJs! Pingback: Get Cozy With Us at The Mommy Monday Blog Hop!